Liang, G., Song, J., Liu, G., Walls, R., Li, G., Wang, Z. & Yin, H. (2005). Are teachers in China ready to teach in the 21st century?. 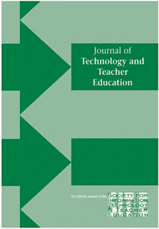 Journal of Technology and Teacher Education, 13 (2), 197-209. Norfolk, VA: Society for Information Technology & Teacher Education. Retrieved April 19, 2019 from https://www.learntechlib.org/primary/p/26104/.